Sopwell House offers a variety of dining experiences to match every mood or whim. The range of restaurants include fine dining, casual/informal, and a place to relax with a cup of hot tea or cocktail. The Restaurant serves dishes that change with the seasons due to the use of fresh, locally sourced ingredients. With a AA Rosette award, The Restaurant offers a fine dining atmosphere with high ceilings and sleek decor. Reservations are recommended, menu prices are set at £35.00 per person. Sunday, Wednesday & Friday, 12:30 p.m. - 3:00 p.m.
Wednesday - Saturday, 7:00 p.m. - 9:30 p.m. Guests can enjoy a relaxed meal at this vibrant eatery which offers all-day dining. Breakfast and lunch are served buffet-style and dinner can be ordered a la carte or from a Set Menu. Buffet prices run from £22.50 - £27.00 per person. The Set Menu is priced at £26.50 and comes with a choice of four starters, four main courses, and four desserts. Monday - Friday, 6:30 a.m. - 10:00 a.m.
Saturday, Sunday & Bank Holidays, 8:00 a.m. - 10:30 a.m.
Monday - Friday, 12:30 p.m. - 3:00 p.m.
Saturday, Sunday & Bank Holidays, 12:30 p.m. - 3:30 p.m.
Daily, 6:30 p.m. - 10:00 p.m. The ideal place for guests to kick back and enjoy a few drinks and catch up with friends or simply reflect on the centuries of history surrounding the storied Sopwell House. Snacks, drinks, light meals, fresh salads, and sandwiches are available. 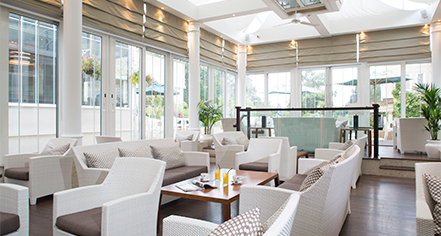 A St. Albans local favorite, the Conservatory Bar is stylish and a relaxing place to enjoy a beverage before dinner. The space is light and airy with restorative views of the lush gardens. Light meals, sandwiches, and various snack are served throughout the day. Weather permitting, the doors are opened and patrons can enjoy time on the Terrace. 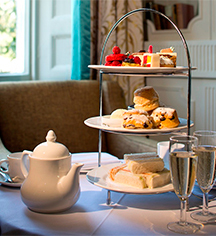 In the great British tradition of afternoon tea dating back to the 1800s, guests can choose to enjoy their mid-day break in the stylish Cocktail Bar & Lounge or in the more elegant Restaurant. Accommodations can be made for those with special dietary needs who give at least 48 hours advance notice. However, Sopwell House cannot give a 100% guarantee that any items are served 100% allergen or intolerant free. Daily, 1:00 p.m. - 5:30 p.m.